I met Denise Austin yesterday, while attending an event hosted by the President's Council on Physical Fitness. When I met her, I was fully prepared to hate her. I was ready to roll my eyes at her vacuousness, her rank commercialism, her shallowness, her dippy blondeness. And in some ways, she was exactly what I expected: she's definitely a blonde bundle of energy and passion. 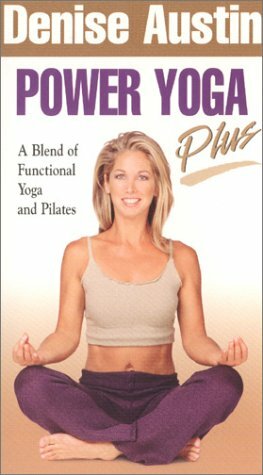 For example, while discussing the difference between Yoga and Pilates, she explained that Pilates was much more about core muscles. She then proceeded to make everyone in the group feel her abs to see how strong they were. I kid you not. And when I passed that information along to another attendee, the response was, "Oh yeah. She makes everyone do that." Really. Surprisingly, however, I found that I didn't hate her. In fact, I was enchanted. I mean, don't get me wrong, more than 30 minutes chatting with her would wear me out, but all her passion and energy are completely genuine. She was excited to share what was important to her, and excited to hear what was important to you. She even gave me a big hug when I tried to politely excuse myself. The world would be a better place with more folks like her. And better with less cynicism like mine. So here's something I never thought I'd say: I'm going to try to be a little bit more like Denise Austin from now on. Great entry! I agree that when I first discovered Denise Austin I almost couldn't stop myself from gagging every time she opened her mouth. Being an overly cynical person myself, extremely positive people really drain my energy. However, I also agree that she seems incredibly genuine, which is a characteristic found all too little in the world today. The world would be a better place if we all tried to be just a bit more like this woman... though not too much like her.